The city and area of Kronach, which celebrated its 1000-year anniversary in 2003, was ever then part of the Prince-bishopric of Bamberg, until it was occupied with it by the Kingdom of Bavaria in 1803. 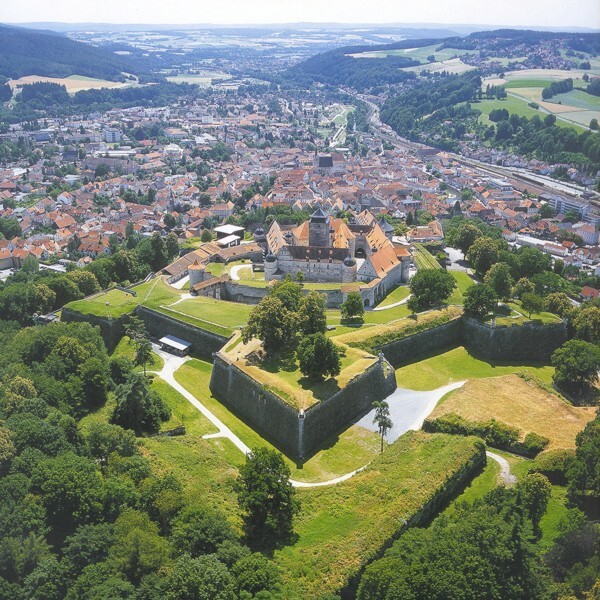 With its strong fortifications - the complete city walls with one city gate, four towers and several bastions still exist - together with the huge Fortress Rosenberg (‘Rose Mountain’) above, Kronach served for centuries as the most important stronghold of the Prince-bishopric of Bamberg, whose residence city Bamberg itself never was fortified. But since the Prince-bishop’s army was of limited numbers and far away, the Kronach citizens had to care themselves for their own defence. So the ‘Ausschuss’ (lit. ‘commission’) as a kind of local militia was formed up in danger or times of war under official command. Such ‘Ausschuss’ was quite usual in the 16th and 17th century not only in the Prince-bishopric of Bamberg but also in enemies’ territories. The citizens of Kronach as well as the citizens in the surrounding villages of the circuit had been bound to report for military service. A mustering-roll ordered in 1616 by the commander-in-chief of the fortress, Carl Neustetter called Stürmer, is still preserved in the city-archives. A part of the ‘Ausschüsser’ (militia men) has been on service in the fortress, others in the ‘Rechte Stadt’ (lit. the city proper), the walled city. But the citizens in the walled city also used to have a standing militia since already according the regulations of the city rules of 1575 the ‘Viertelmeister’ (burgomasters of the city-quarters) had to show up with the ‘Ausschüsser’ of their quarters ‘in best armour and weapons’ whenever alarm was given. Subsequently, the ‘Ausschuss’ also played its part in mounting of the guards and other public processions. Especially in the years from 1632 to 1634 during the Thirty Years’ War, when Kronach had to withstand several times fierce attacks and sieges by the Swedish Crown’s confederates, the armed citizen’s ‘Ausschuss’ probably played the decisive role when the city and the fortress stayed undefeated in those crucial days. To keep alive the memory of this afterwards famous Kronach citizens’ self-defence in this era a couple of history-interested Kronach people of different professions started the Cronacher Ausschuss Compagnie (Cronach Militia company) again in 2001 to give a ‘living-history’-presentation of the military and civil life in the 17th century for a vivid look back in history. So the authentic militia-men’s dress, the epoch’s typical equipment or the re-enactment of fighting scenes are all aims of the Cronacher Ausschuss Compagnie - also by participation in the ‘Historisches Stadtfest“ (historical town-fair) in Kronach, held every last weekend in June. Since Kronach in those days also had some famous gun-makers the activities of the Cronacher Ausschuss Compagnie also include the showing and presentation of historical guns and the use of them. Meanwhile, the modern ‘Ausschüsser’ manufacture authentic replicas of matchlock-muskets and -pistols of their own. The Cronacher Ausschuss Compagnie shows armour and drill of pike men and musketeers, a field gun with complete equipment as well as landsknecht’s songs and military camp live of the 17th century. The Auschuss’ flag in the city colours white and red bears the old city-arms of Kronach with stone tower and three roses, which the city carried until 1651, when the Prince-bishop granted a new noble coat-of-arms as a tribute to the citizen’s bravery in the Thirty Years’ War. The written history of Kronach dates from 1003, when it was first mentioned. But the place of settlement is much older, as the remnants of a bronze-age castle (1500 b. C.) and the recently excavated foundation walls of donjon of the 8th century A. D. show. The fortress Rosenberg is first mentioned in 1249 und has been strengthened and extended to a large Baroque fortress after the Thirty Years’ War. It is very well preserved and presents one of the largest fortresses in Germany. The picturesque city of Kronach, nicely sited between the rivers Hasslach, Kronach and Rodach, is fascinating with its late-mediaeval character formed by the historical heart of the town and the never defeated Fortress Rosenberg. As the most famous son of Kronach counts Lucas Cranach the Elder (1472-1553), one of the masters of South German Renaissance painting. Known in whole Europe is the "Father of Celtology" Johann Kaspar Zeuss (1806-1856) was born in a suburban village of Kronach. The modern city of Kronach has a number of 18.500 inhabitants and is seat of the county of Kronach (population 75.000, area 650 km²).The geographical coordinates of Kronach are: 11°19' e. long. / 50°11' n. lat.